Enjoy a relaxing paddle where your group can interact on a different level, without the burden of a workday to interfere. Add a few tasks designed to hone judgment and decision making skills and you have a perfect team building atmosphere. Make it lots of fun and you’re sure to have a happy group of kayakers. If you’re looking for a team building experience for your employees or just want to reward them for their job performance, Kayak East has the solution. We can tailor a program to fit your specific needs and goals. We use comfortable and stable kayaks to ensure everyone will relax and be safe on the water. We also have tandem kayaks for those who wish to share. Groups up to 18 people can be accommodated and a typical outing is 3 hours in length. Numerous locations are available and we can choose one near to your location helping minimize travel time for your employees. For more details or to book your company team building outing call 1-866-529-2532 or contact us using the form below. Give your camp/school kids a day they’ll remember! 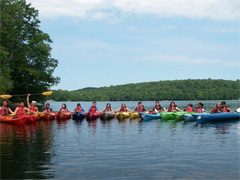 Kids love the water and what better way to enjoy it than kayaking and stand up paddle boarding. We’ll start the day with a safety lesson and some instruction to familiarize each person with their equipment. Then we’ll head out to explore the environment, play some fun water games, and discover nature, adventure and good times. We trailer our equipment to various locations and can choose a spot near to you minimizing your travel time. Typical outings are about 3 hours but can be more or less depending on the needs of your group. 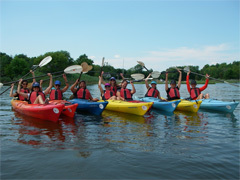 Groups are limited to a maximum of 20 people on the water at any one time and the cost is dependant on the group size and duration of the outing. For more information or to book your adventure call 1-866-529-2532 or contact us using the form below.